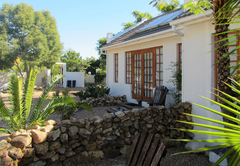 The Stables Lodge is a 3 star graded guest house with self catering option, offering Stellenbosch accommodation for tourists and visitors of the Cape Winelands. 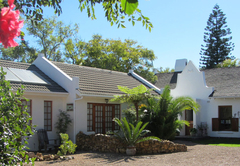 A warm and friendly Italian welcome awaits you in the, quiet, exclusive residential area of Mostertsdrift, just five minutes drive from the picturesque town centre. 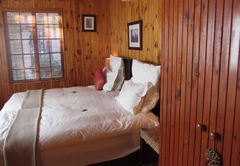 The Stables Lodge offers panoramic views overlooking the mountains. 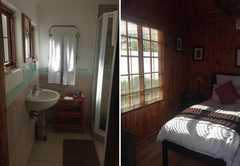 Ideal for family & friends - with its own entrance and a little relaxing area outside.The main room has a queen bed, a connecting room with two single beds and en suite shower / toilet. 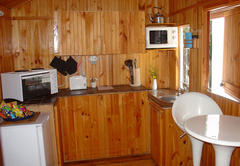 Coffee and tea facilities, safe-deposit box, air conditioning and / or heated, radio CD player and a small fridge. 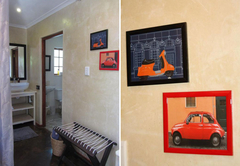 A little piece of Italy in South Africa! 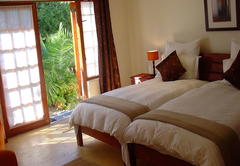 The Guest House is ideally located to explore the famous wine lands as well as a lot of other excursions and day trips. 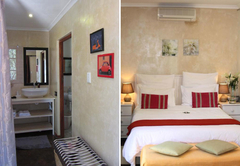 A beautiful atmosphere is created using a fusion of Italian and African styles making this affordable stay one to be remembered and repeated! Italian and English spoken. 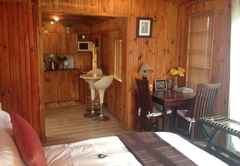 A queen size bedroom with its own entrance, little relaxing area outside, air-con/heater, en suite shower/toilet, towel rail heater, tea&coffee facilities, radio CD player, safe-deposit box, hairdryer. Interior door with direct access to the common area. 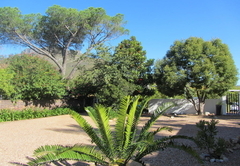 With its own entrance and a little relaxing area outside.The main room has a queen bed, a connecting room with two single beds and en-suite shower / toilet. Coffee&tea facilities, safe-deposit box, air-conditioning and/or heated, radio CD, a small fridge. 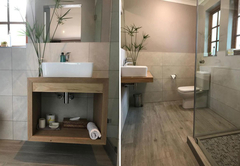 This free standing unit is situated at the back of the property and it offers twin beds, en suite shower / toilet, air-con / heater, towel rail heater, hairdryer, safe-deposit box, kitchen (oven, microwave, fridge etc), radio CD player. 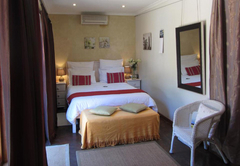 One queen size bedroom + 1 single bed with its own entrance, little relaxing area outside, air-con / heater, en-suite shower / toilet, towel rail heater, tea and coffee facilities, radio CD player. 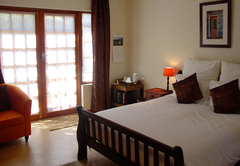 37 Reviews from SA-Venues.com travellers. All reviews are verified. Had a pleasant stay and will certainly recommend it. Until next time! Ideally located... Peaceful and tranquil setting... A sense of home away from home. The hospitality of the hostess is exemplary, and we had an awesome stay... Thank you! Response timeThe Stables Lodge typically responds to requests in 5-10 minutes. Please note that it is essential to confirm time of arrival, because we do not have a 24 hour reception service.